THE WAY IT WAS SUPPOSED TO BE IN THE FIRST PLACE! Welcome to WISDOM IN GOLF, where the secrets to your golf game bliss are super-backed by science, neurology, medicine, and all other sports and disciplines. Come see why focusing on body part manipulation will always end in disaster. Come discover that simply changing your focus to simple tasks will help your performance soar, especially under pressure! Come see how NOT DEFECTIVE you are and how you have been portrayed as needing to be fixed all these decades! Come see why YOUR ANATOMY WAS MADE TO PERFORM GOLF MOVEMENTS and how you are a GRAVITY GENIUS! Come see why one of the top Clubs in the country, Royal Québec, chose Wisdom in Golf’s Chairman, Shawn Clement, to Develop their Golf Academy! THERE IS A HUGE DIFFERENCE between positional teaching and learning and TASK AND TARGET BASED teaching and learning. WE HUMANS ARE NOT DEFECTIVE! – we are learning machines. And when you learn, there are no mistakes, just “is or is not”, “doing or not doing” or “on or not on task”. Imagine a place where you feel relaxed, engaged, and absorbed, where the theme is abandonment of control instead of seeking more control, feeling rhythm come to you instead of manipulating rhythm, and painting with broad and fluid strokes instead of painting by numbers. We chose the word WISDOM because it embodies what we do and teach: that combining knowledge, experience, understanding, and common sense all lead to better performance. 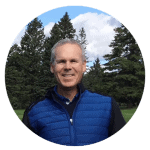 Led by Shawn Clement, with 30 years teaching experience and helping golfers up their game, WISDOM IN GOLF taps in directly to how your brain and body are wired and formed to open the door to a new way of approaching the game of golf. THIS IS TRULY HOW GOLF SHOULD HAVE BEEN TAUGHT IN THE FIRST PLACE!